This is actually a book of Syaduna Imam al -Qusheyri (the famous ) and the name of his book is Al-ilmaam-bi-Ahadees-al-Ahkaam. This is its Sharah by Molavi Mahmud Ahmed Ghazanfar and is Published by Naumani Kutubkhana Lahore Pakistan, on its page 303 under the chapter of Salat (Namaz Types). 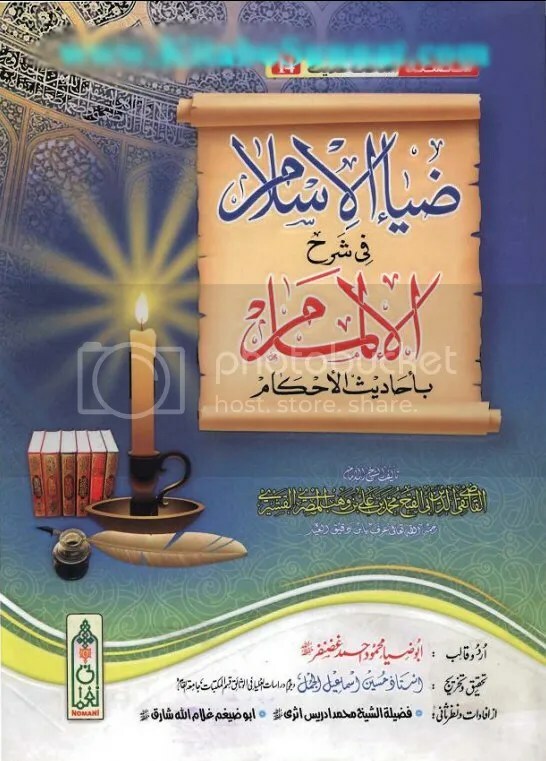 In the sub-Chapter of Istisqa, there is a famous hadith given by Hazrat Imam Qushayri which is very famous and we many times presented it as because of its authenticity. “O Allah! We asked for (raining) by the (Intercession of Blessed Prophet Sal Allaho alehi wasalam) and You Showered upon us Raining, now (WE ARE PRESENTING THE UNCLE OF YOUR BELOVED PROPHET (alehisalam)i.e. Sayduna Abbas bin Abdul Mutalib (Rd)) as an INTERCESSION for us in Your Lordship, we ask You for Raining’. Annas (rd) said:”And the Raining Started“. 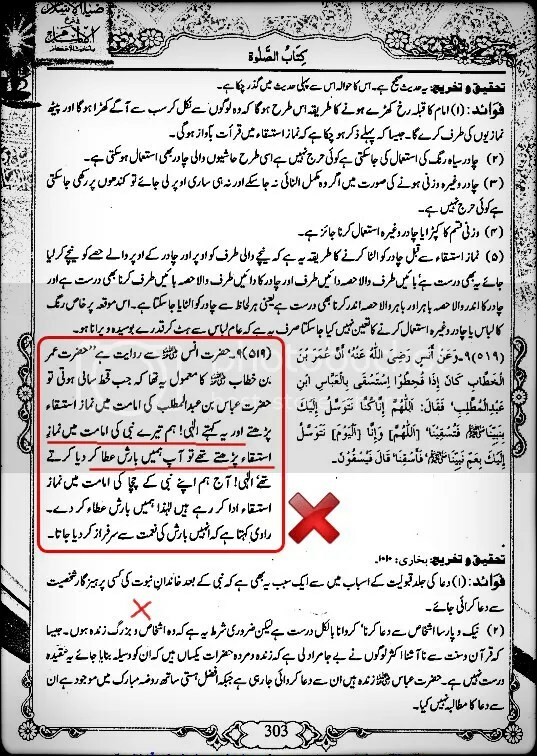 Molvi Ghazanfar did such a shameful act , that he edited the words of Hadith with his own words by Just writing (they Prayed for Rain in the Imamat of Syaduna Abbas), , while in Actual Hadith there is no such word, neither its translation can be as such as he did. Totally taken out the words of Hadith (INTERCESSION) (WASEELA) because it was in contradiction to their (Wahhabi- Deobandi) belief. And this thing does not stopped here. He further totally changed the interpretation of Hadith too, by putting that, one can ask for the (INTERCEDE OF THE PIOUS BUT IF HE IS ALIVE). Which is in itself a Fabrication in Sharia. There is no such kind of Rule, which this Kha’in Molvi presented. This is called work of al-Khawarij. Shame on them and Shame on those Who are Publishing Such Nonsense. Prophet alehisalatowasalam cursed them that whosoever attribute anything or remove anything from that which he has not said. May Allah keep us save from the Ugly Brutal Polytheist, Un-Islamic ways of Wahhabi Fitna. Ameen Bajahun Nabi Alehisalatowasalam Ya Rabul Alameen Jalla wa Shanuhu.